Through the amazing scope of director Clint Eastwood, Letters from Iwo Jima was born from Flags of Our Fathers and this unique director felt that he needed to tell both sides of this World War II movie. Unlike Flags of Our Fathers, Letters from Iwo Jima revolves around two men, General Tadamichi Kuribayashi played by the talented Ken Watanabe and a soldier called Saigo, equally well played by Kazunari Ninomiya. For General Kuribayashi, Iwo Jima holds a strong military value to the Japanese as if this island falls, the Americans will have a base to plan their attack on mainland Japan. Unfortunately for Saigo, he was reluctantly enlisted and to compound the situation, his wife is pregnant. As the Japanese military begins to crumble around Kuribayashi, he gives the command of abandoning the beaches and move towards the mountains where he believes his army will have a military advantage over the Americans. For Saigo, he is caught between his will to live and Japanese honor that causes him concerns, due to the Japan's ruthless approach to war and their view on cowards. The character Kuribayashi is quite interesting as he spent his youth studying in America which Eastwood uses through some great insightful flashbacks of this character and gives him a soul as he attempts to lead his men to victory. Needless to say, both characters draw you into this movie about two totally different social classes and their inner will to live that is judged by the ancient code of the Samurai. At the end of the day, Letters from Iwo Jima is a very dark movie that showcases the atrocities of war, for not only the Japanese but also the Americans as well and once again Eastwood creates a spectacular film, littered with human emotions, social commentary and the politics of the era. Presented in 1080p, the film has this 1940's grace to it that is matched perfectly with the extraordinary picture quality. Where the movie does shine is through the Dolby Digital True HD 5.1 mix which sounds phenomenal through our surround sound setup. This version of Letters from Iwo Jima contains some great special features that truly give you a unique insight into the creation and history of this movie. In conclusion, Letters from Iwo Jima is almost as good as Flags of our Fathers, however delivers the viewer a unique insight into the other side of the war which is insightful and quite dark at times. 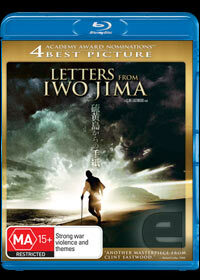 Beautifully transferred to the Blu-ray format, Letters from Iwo Jim is another must have disc with stunning video and audio quality with a story to match.